The Hurtigruten (meaning ‘Express Route’) is a system of coastal ferries, founded in 1893, that run between between Bergen in southwest Norway and Kirkenes in the far north near the Russian border. The ships operate as both cruise and local supply ships, making nearly 70 stops on their 11-night round trip to transfer cargo and people all along the coast . 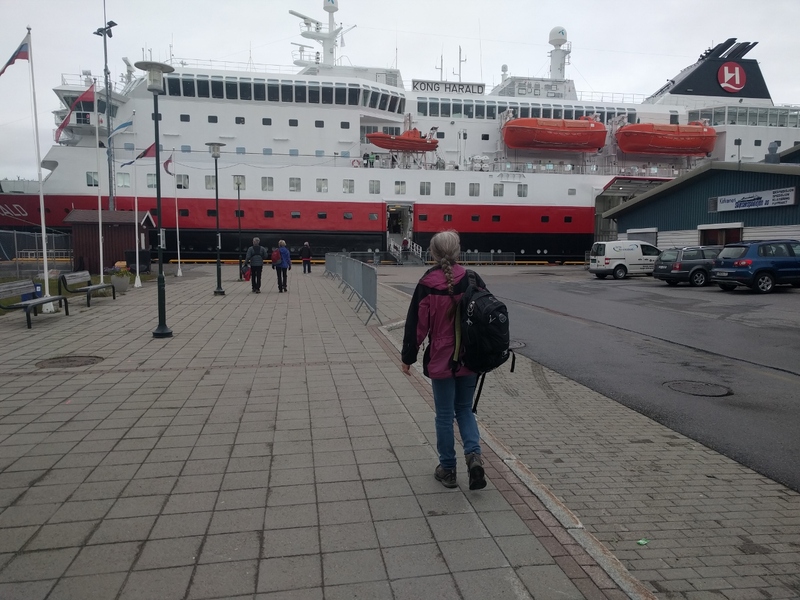 We’d been enjoying spotting the ‘Grutens (as we affectionately call the Hurtigruten ships) almost every day since arriving into Norway, both underway and when we stopped in centers such as Svolvær and Tromsø, where they dock twice-daily. 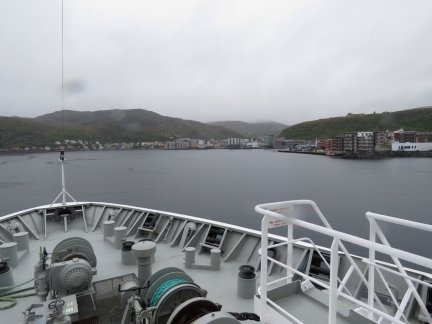 Shortly after returning to Tromsø from Svalbard, we booked a flight to Kirkenes with a one-night return passage on the Hurtigruten Kong Harald. 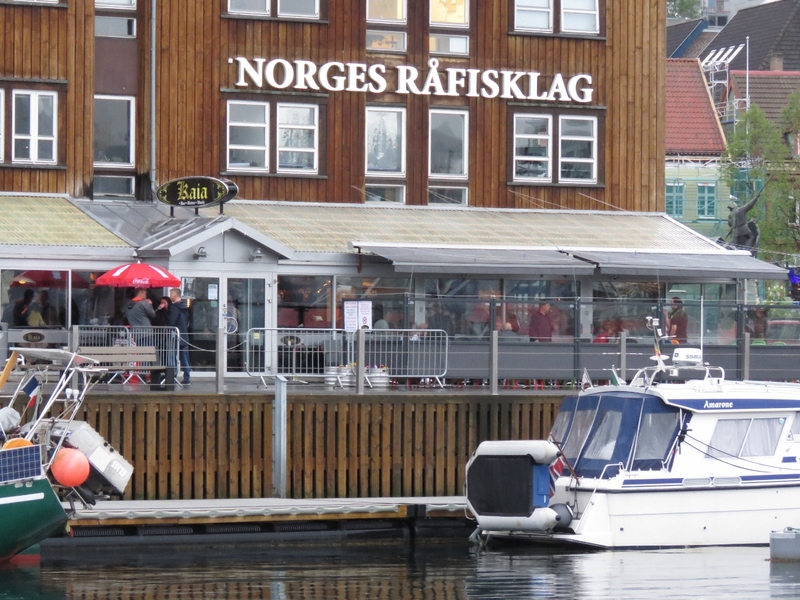 This allowed us to see Norway’s north coast, since Tromsø was the farthest point north we’d go in Dirona on this trip. 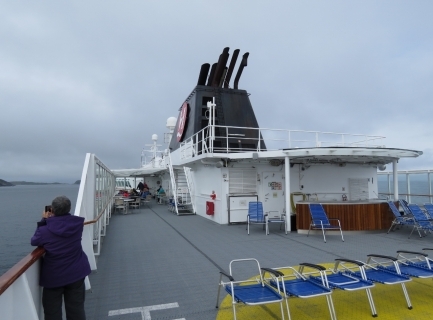 And it also gave us an opportunity to experience travelling on the Hurtigruten and to watch the ships operate underway. We had a fabulous trip and really enjoyed our time on board and the various stops along the way. 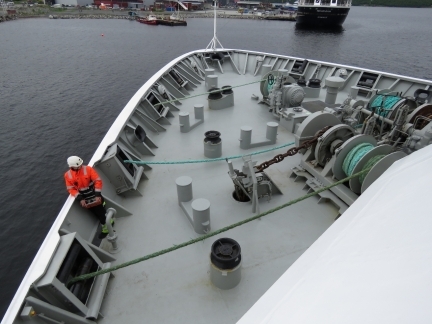 Rower heading out of Tromsø in what looks like a well-rigged vessel. We’ve had a stereo hum when the engine is running and the hum is proportional to the charging rate of the start alternator. High charging rates hum quite a bit and low charging rates very little. It’s quite visible on the oscilloscope and we chased it down to the connection between the source stereo in the salon and the stereo in the PH. We tried the easy solutions like a large capacitor between the start alternator and ground. The problem appears to be a ground plane difference causing a ground loop. 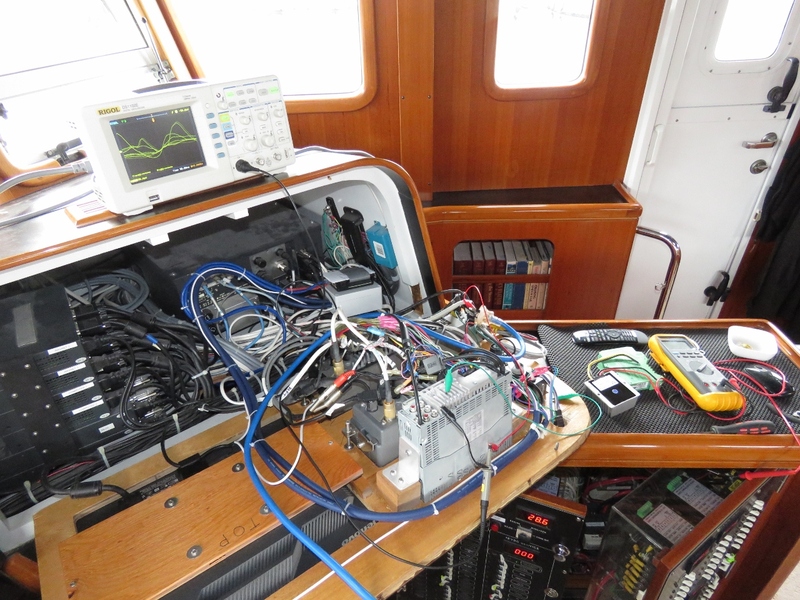 We ordered a ground loop isolator which we expect will solve the problem. 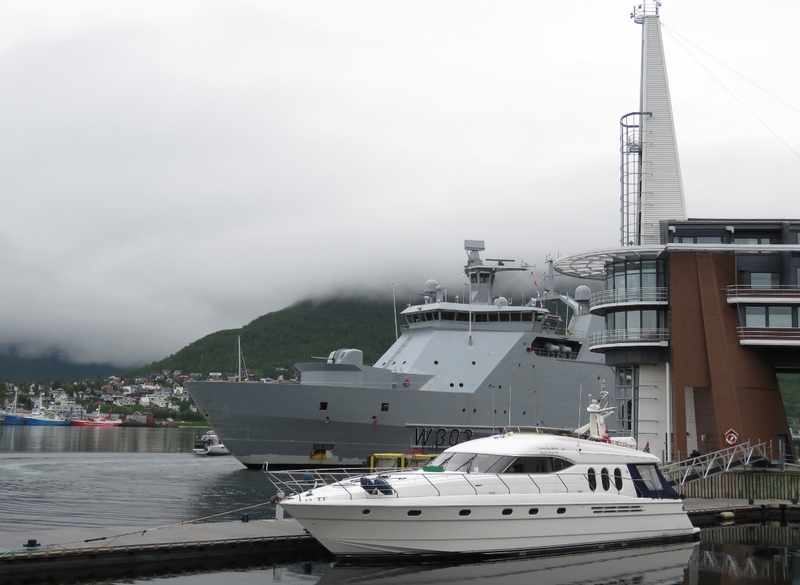 The Norwegian Coast Guard ice breaker and patrol ship Svalbard arrived into Tromsø this morning. The 340.2 ft (103.7 m), 6,375 tonne-vessel is the largest in Norway’s military armed forces by tonnage. 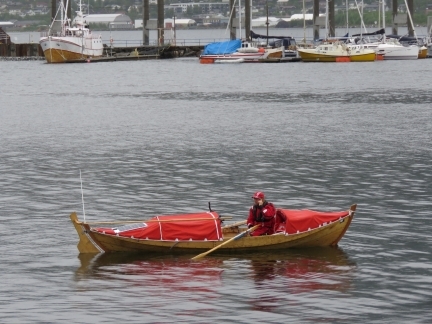 The ship is double-acting, meaning it can break ice running both forward and backward. We’ve been feeding Spitfire dried cat food most of his life, but switched to Sheba Fine Flakes moist food in London on the advice of our vet there. Since moist food wouldn’t keep for three days, we left dry food out for him when we went to Svalbard. His digestive system, however, didn’t do well with the sudden diet change and he had diarrhea. For our upcoming overnight Hurtigruten trip, we’ve instead made him a “Shebasicle”. 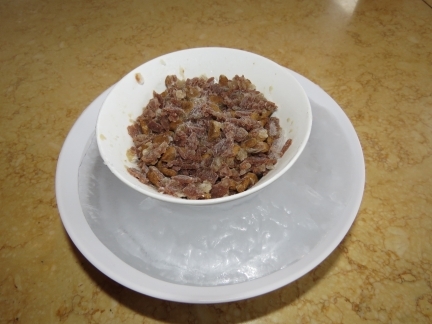 We filled a small bowl with two days worth of Sheba, put that inside a larger bowl of water and froze the whole package overnight. This worked super-well and is our new standard when we travel. 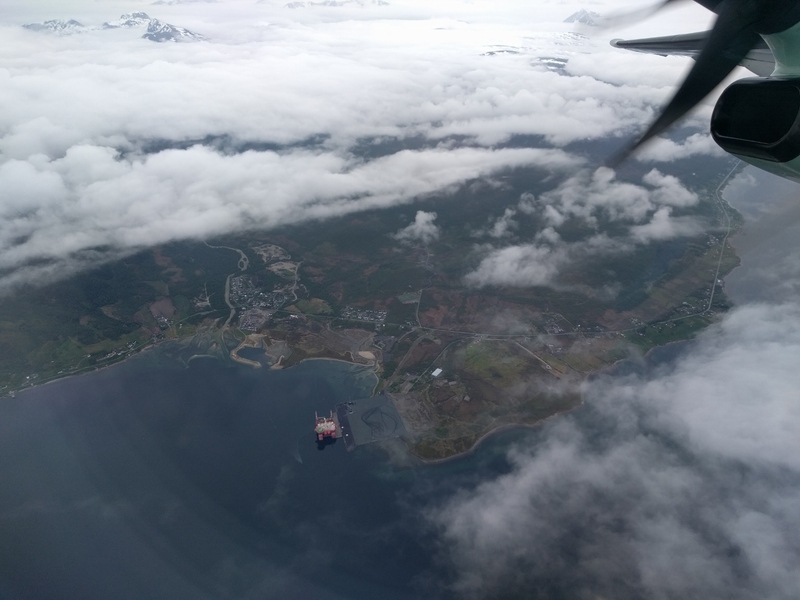 Flying over an oil rig off Tromsø en route to Kirkenes, Norway where we’ve booked an overnight return passage on the Hurtigruten. 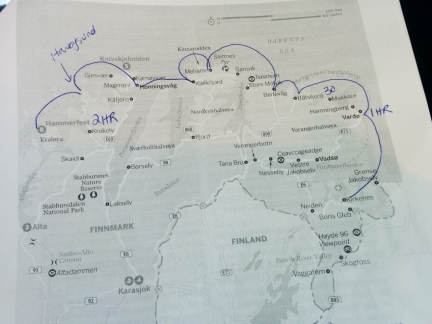 Crossing into Finnish airspace. 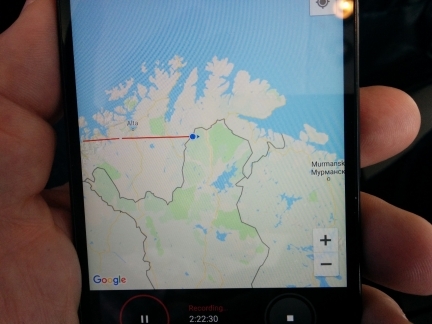 The grey line denotes country borders—Norway is to our west and north and Russia is on the far right. We annotated a Lonely Planet map to show our stops on the Hurtigruten between Kirkenes and Hammerfest. Many of the stops are brief, barely 15 minutes. 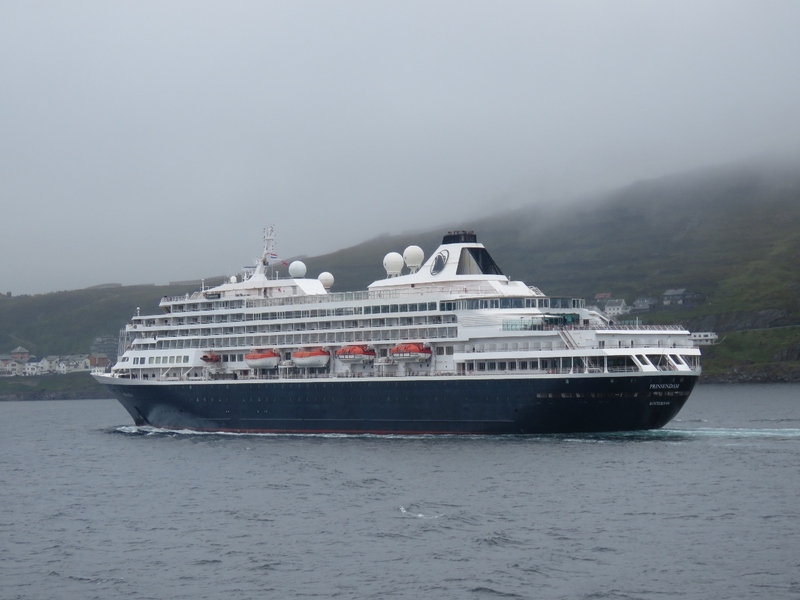 The ships operate as both tour boats and local supply ships, transferring cargo and people all along the boast between Bergen and Kirkenes. 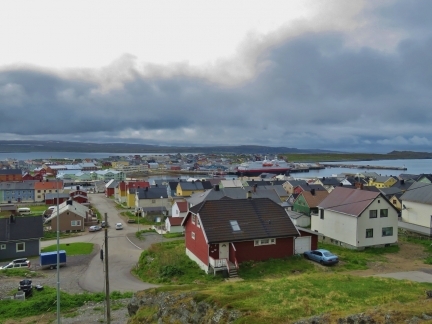 We’ve included the times for the stops that are 30 minutes or longer: an hour in Vardø, 30 minutes in Båtsfjord, and 2 hours in Hammerfest. Longer shore-side excursions are made by rejoining the ship at a port farther along the route. A happy Jennifer at Kirkenes airport. 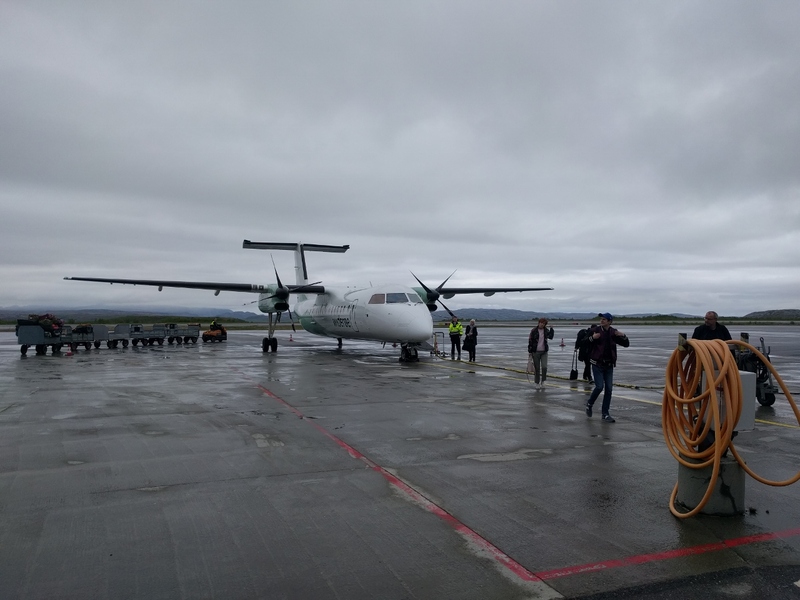 Looking back at our ride from Tromsø to Kirkenes, a Widerøe Bombardier Dash 8. Road sign for Murmansk, Russia on the bus ride from the airport to the harbor. 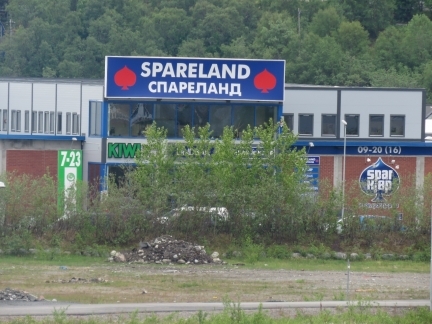 We’re only 6.2 miles (10km) from the Russian border. 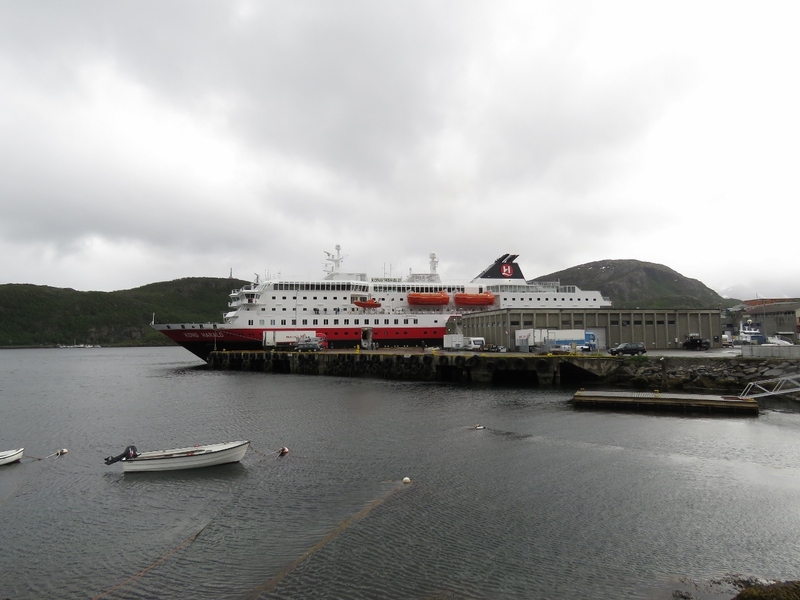 Our ‘Gruten (as we affectionately call the Hurtigruten ships) Harald Kong, moored in Kirkenes, Norway. 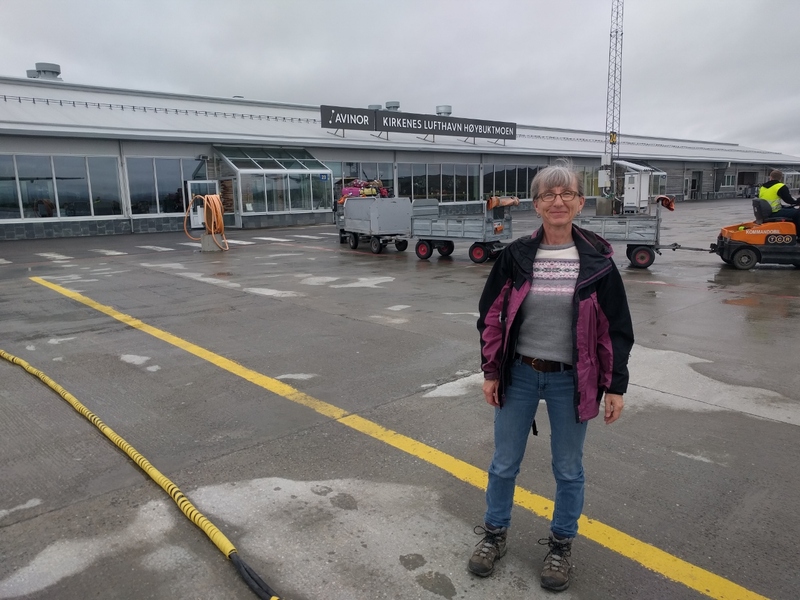 We’re super-excited about the trip—this will give us a view to the northernmost reaches of coastal Norway, as well as a fun ride on the Hurtigruten. 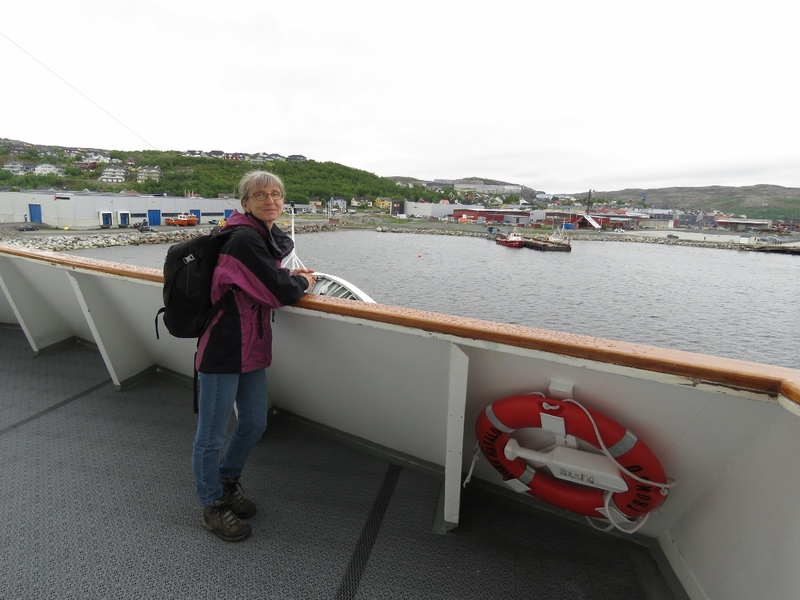 On board the Hurtigruten Kong Harald overlooking Kirkenes harbor. 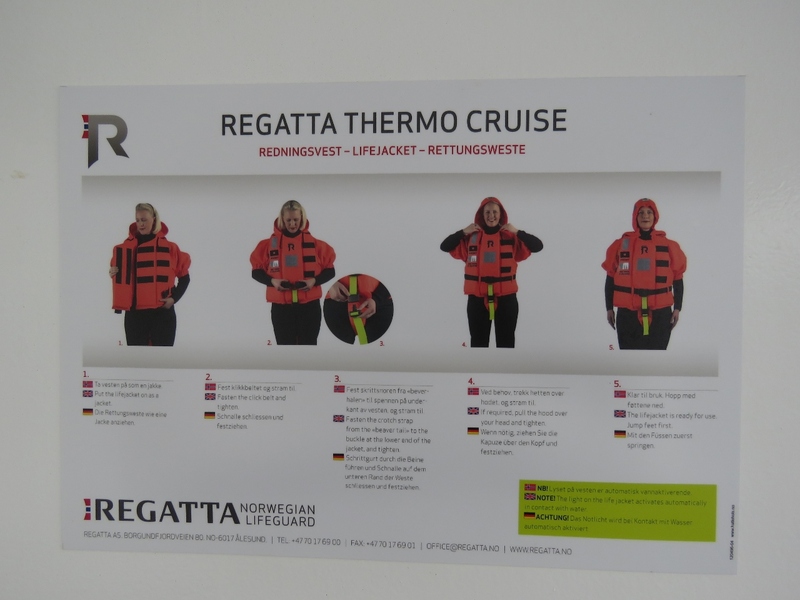 The lifejackets we’ve seen here in Norway look to be an excellent design, with protection from initial cold shock and hypothermia. Regatta developed these lifejackets following the tragic 1994 Estonia disaster when the ship sank in rough weather in the Baltic Sea. 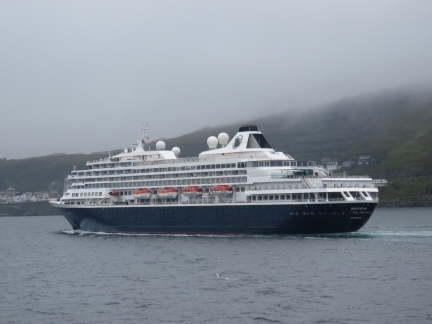 852 of the 989 people on board died, mostly of drowning or hypothermia. 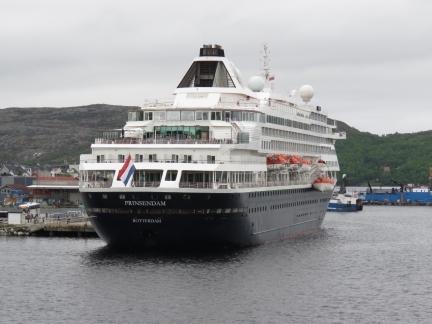 The cruise ship Prinsendam moored at Kirkenes. 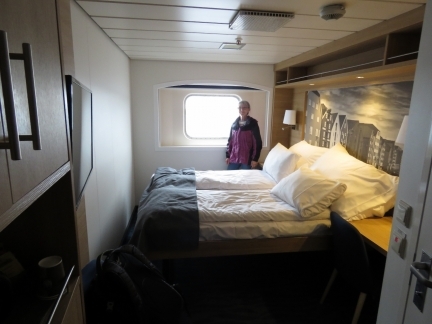 Our cabin for the night on the Kong Harald. We didn’t spend much time in the cabin, but enjoyed the cabin and the view out the big window when we were there. 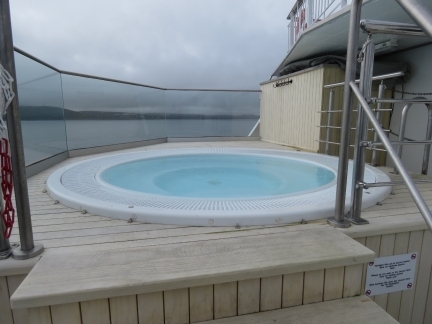 One of two hot tubs on our cabin deck. 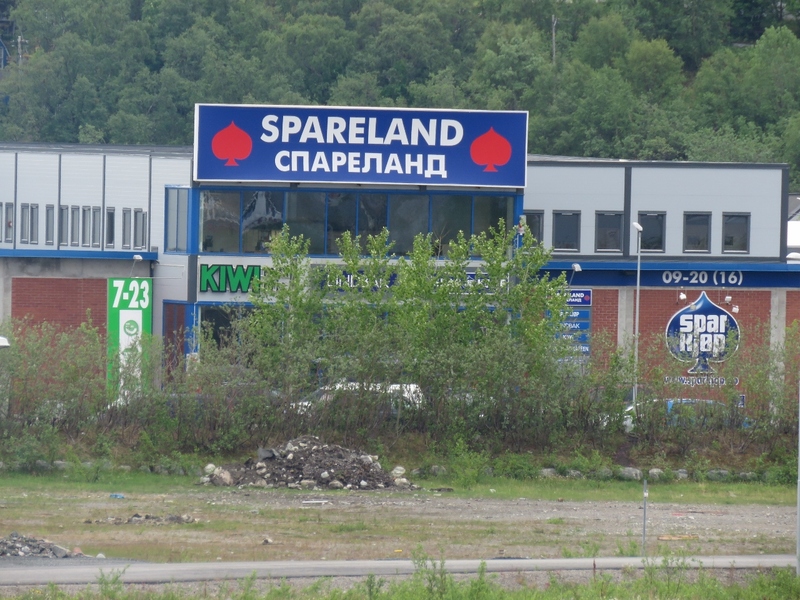 Kirkenes has a large Russian population being only 6 miles from the border, and many of the signs are in both Norwegian and Cryillic script. The line handler on the Kong Harald remotely controlling the winches to retract the lines. 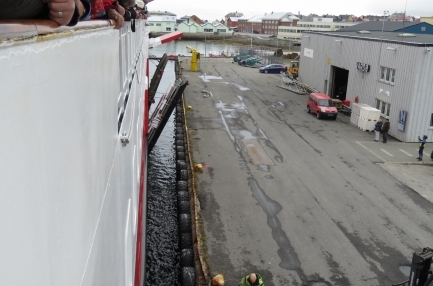 Like the cruise ships we’ve seen, the Hurtigruten skippers make ample use of their thrusters when leaving the dock. We snagged an excellent window table for lunch. 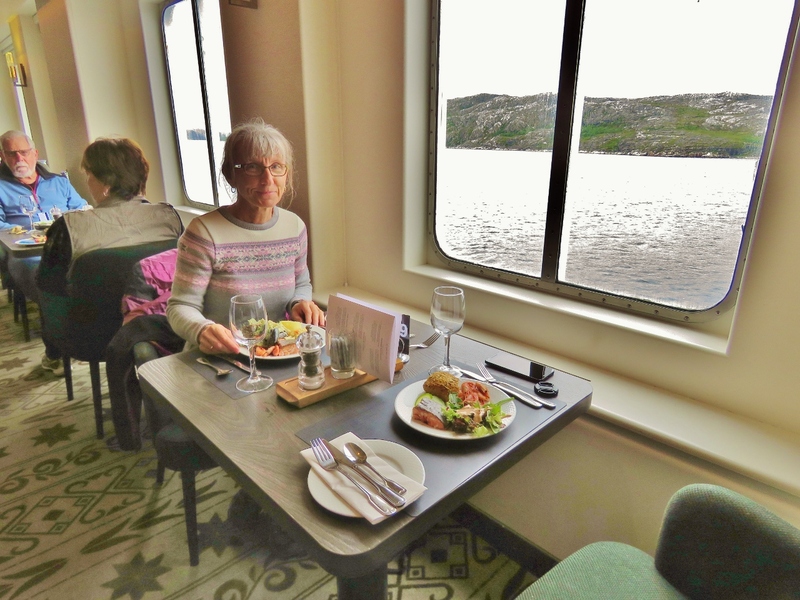 The food on the Hurtigruten is delicious—we really enjoyed it. 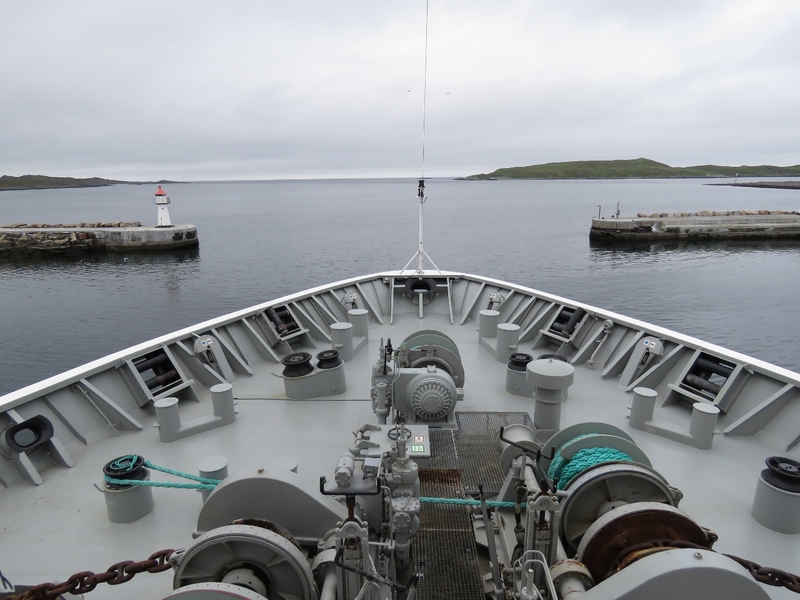 View from the stern on an overcast, but calm day. Looking across deck seven to a protected outdoor viewing deck, with the indoor viewing decks beyond. 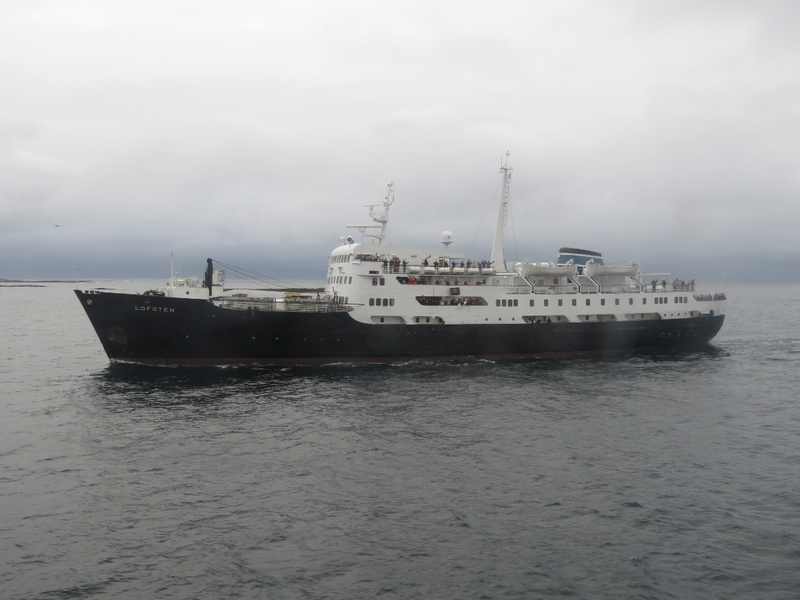 As cruise ships go, the Kong Harald is not very large with a passenger capacity of 590 people, but it was comfortable. 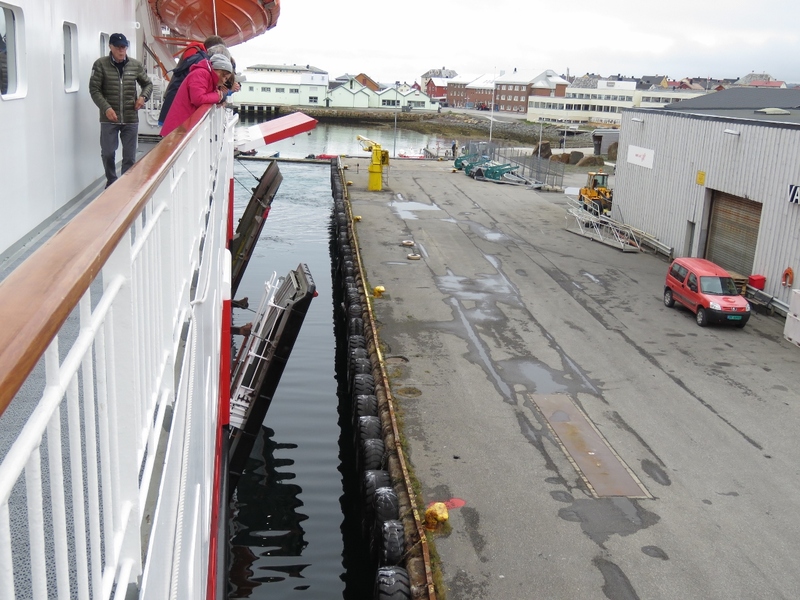 Arriving into our first stop at Vardø, 3 hours and 45 minutes after our departure from Kirkenes. 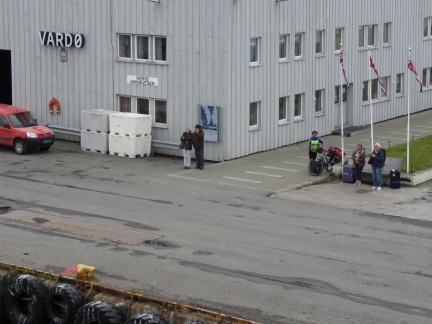 Passengers waiting for the ship in Vardø. The person on the bicycle has been touring all over Europe for months and took the Hurtigruten for only a few stops. 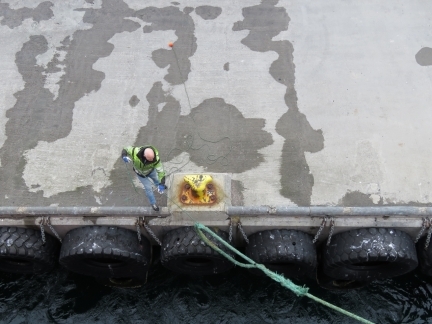 Shore-side line handler pulling in the main line from the messenger line with the orange ball on the end. The Hurtigrutens operate efficiently, with the doors already opening well before the ship is on the dock. 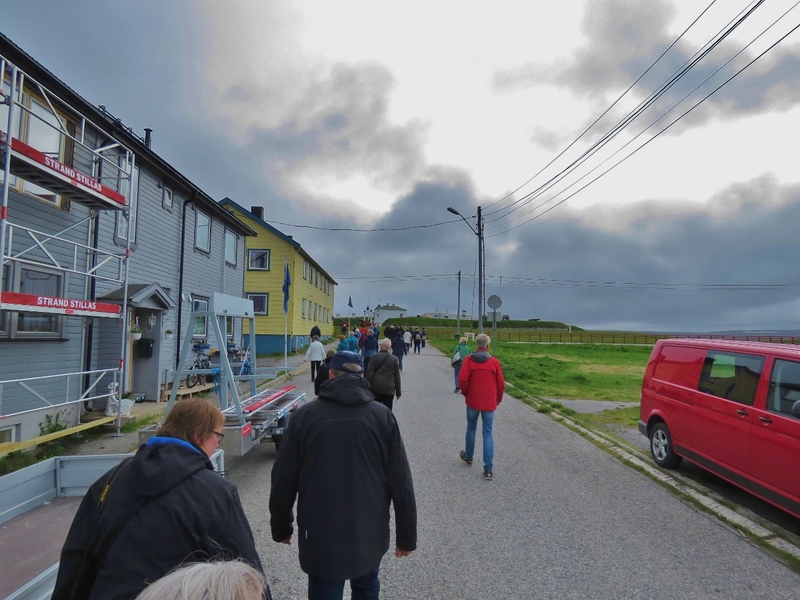 Following pretty much everyone on the ship out to Vardøhus Fortress. This is why we aren’t big fans of travelling in large groups. 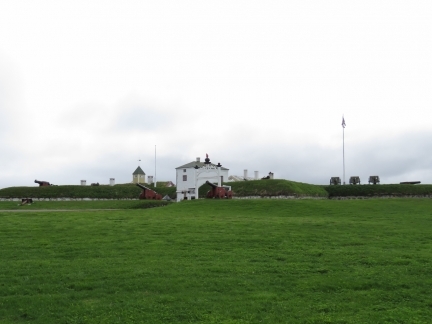 Vardøhus Fortress forms a perfect, eight-point star and was erected in the 1730s to secure Norway. 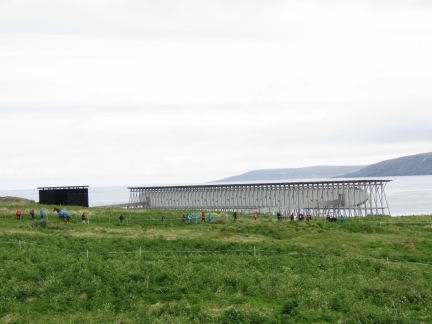 It’s the northernmost fortress in the world and was operative until the 1950s. 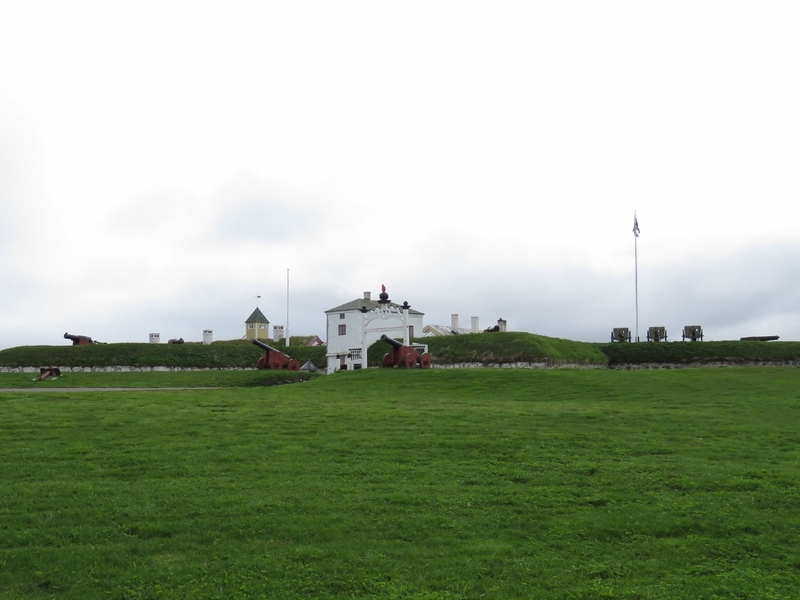 The Steilneset Memorial near Vardøhus Fortress commemorates the 91 women who were executed for witchcraft in Vardø in 1621. Vardø Church was built in 1958 after the previous church burned down in 1944. We had just enough time on our one-hour stop to climb a small hill east of town for a nice view over Vardø. Bust of Willem Barentsz, a Dutch navigator, cartographer, and Arctic explorer who made three expeditions in search of the Northwest Passage. 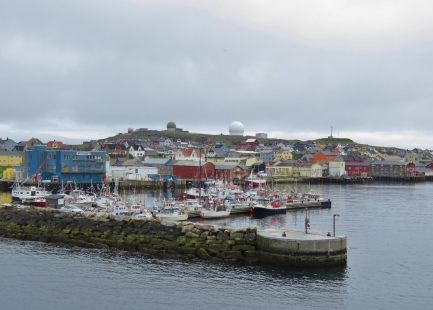 Vardø was the starting point for most of Barentsz’s expeditions before entering the Arctic Sea. 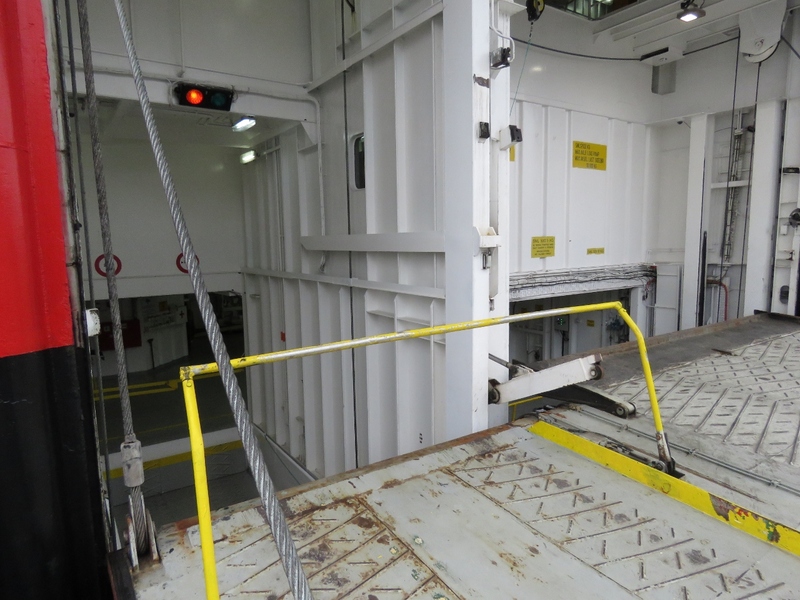 A close-in view to the car elevator on the Kong Harald. The doors closing as our ship departs Vardø. 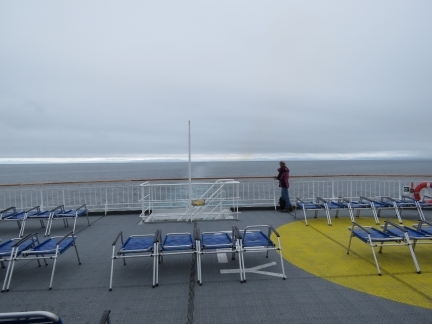 Like ourselves, many of the other passengers like to watch the activity of arriving into and leaving port. The gap in the Vardø harbor breakwater looks really tight for the Kong Harald, but the skipper manages it with ease. 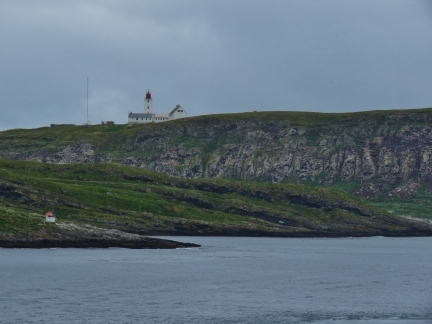 The Vardø Lighthouse on the island of Hornøya, built in 1959, is the easternmost in Norway. 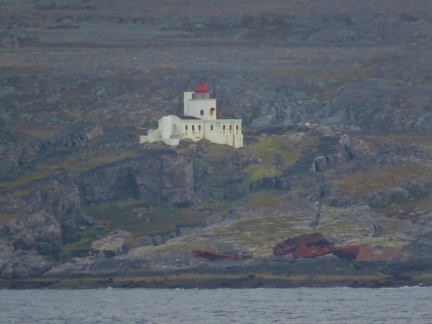 Makkaur Lighthouse off Båtsfjord above the wreck of a large ship. 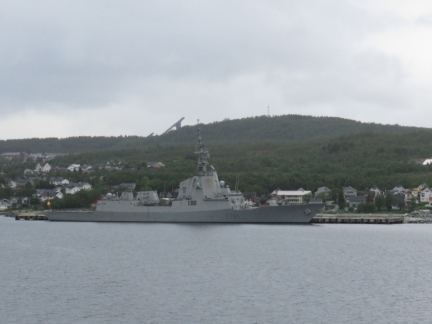 That must have been some storm to drive the hull that far ashore. The lighthouse was originally built in 1928, and rebuilt after being destroyed in World War. 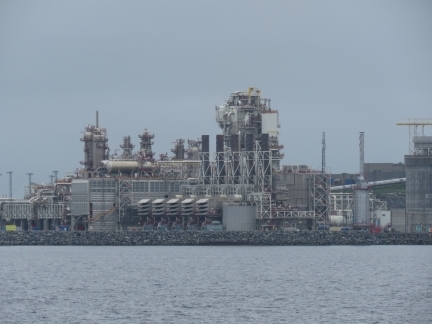 It was automated in 2005 and only runs between August 12 and April 24 when there is no midnight sun. 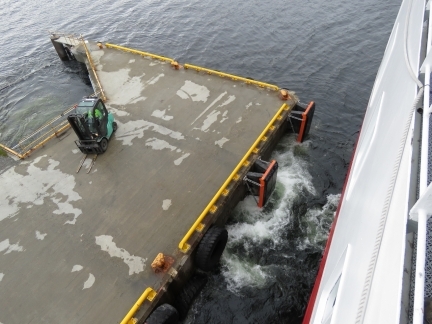 Coming onto the dock at Båtsfjord. We only had a 15-minute stop on Båtsfjord, so made a quick run ashore to take a couple of pictures from a small hill. 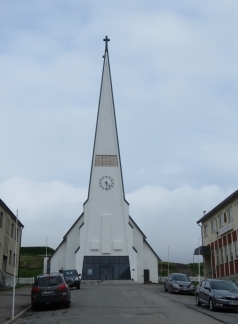 This is looking northwest to Båtsfjord Church, built in 1951. 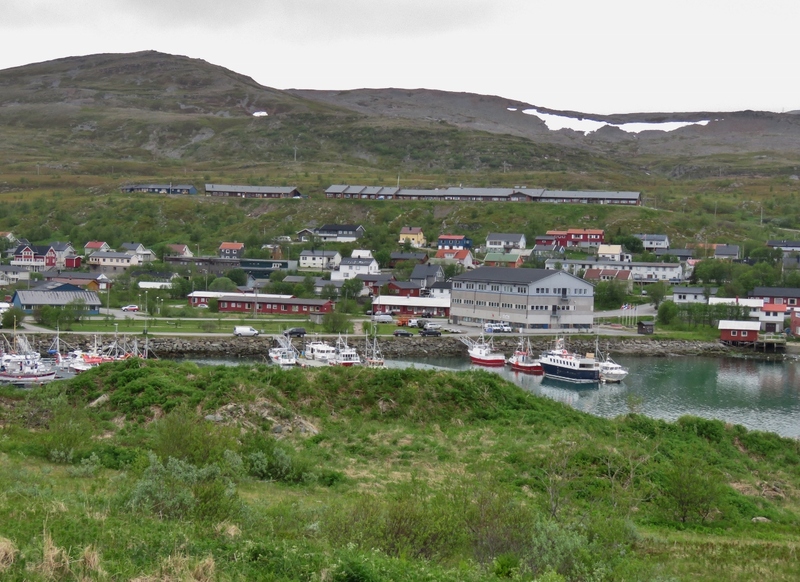 Fishing boats in Ytre Haven at Båtsfjord. 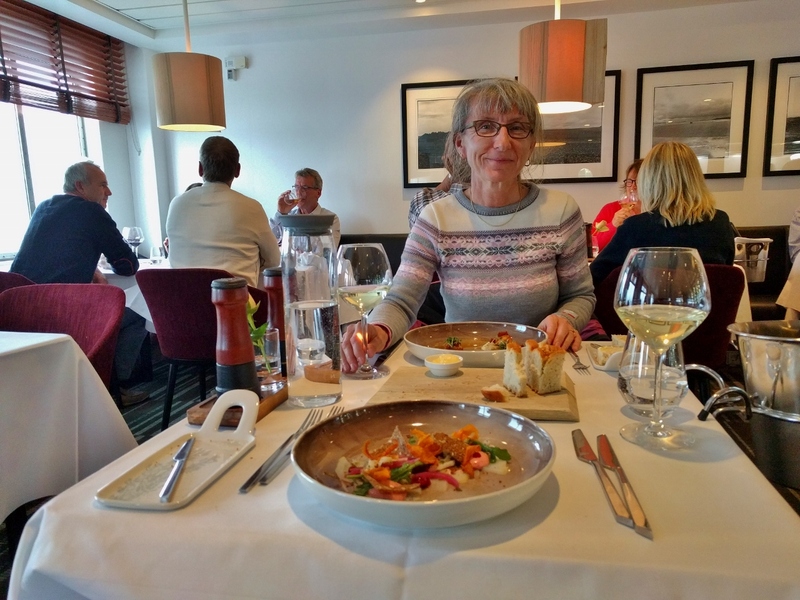 An excellent meal at Kysten, the Kong Harald‘s new a la carte restaurant. 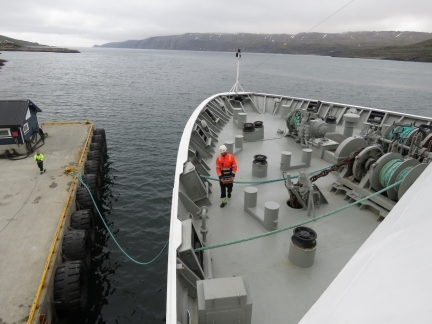 Another close-quarters channel as we depart Berlevåg following a quick 15-minute stop. The Lofoten entering Berlevåg as we depart. 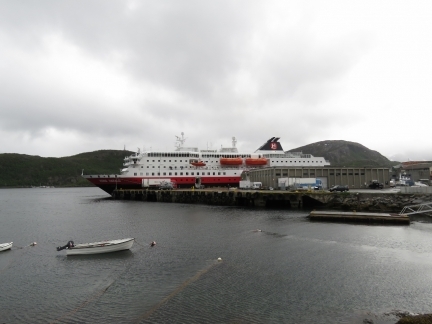 Launched in 1964, the Lofoten is the oldest ship in the Hurtigruten fleet and is popular with those wanting a more traditional coastal experience. 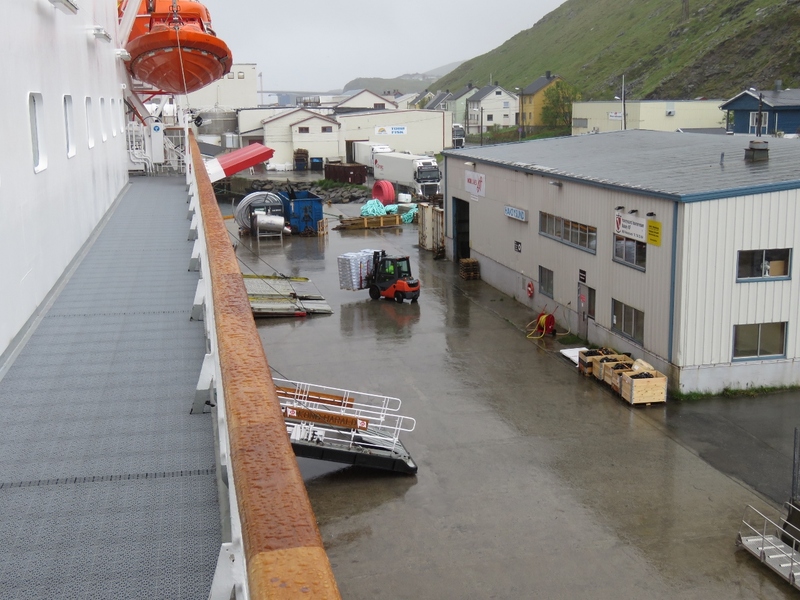 Unloading goods on a rainy morning during a 15-minute stop in Havøysund. Raising the stern ensign in the morning. The Hurtigrutens carry mail so fly a POST service flag. 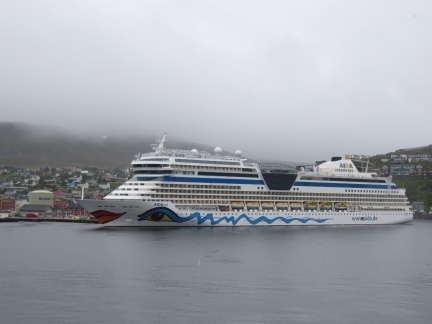 The 831ft (252 m) AIDAsol, with a 2,174-passenger capacity, docked at Hammerfest. Arriving into Hammerfest. 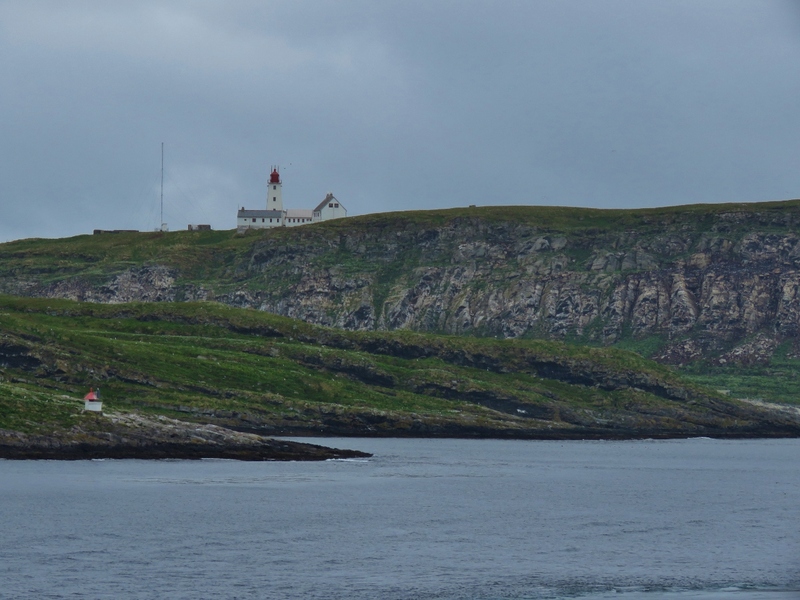 We’ll have a 2-hour stop here, our longest of the trip, so will have a little more time to explore ashore. 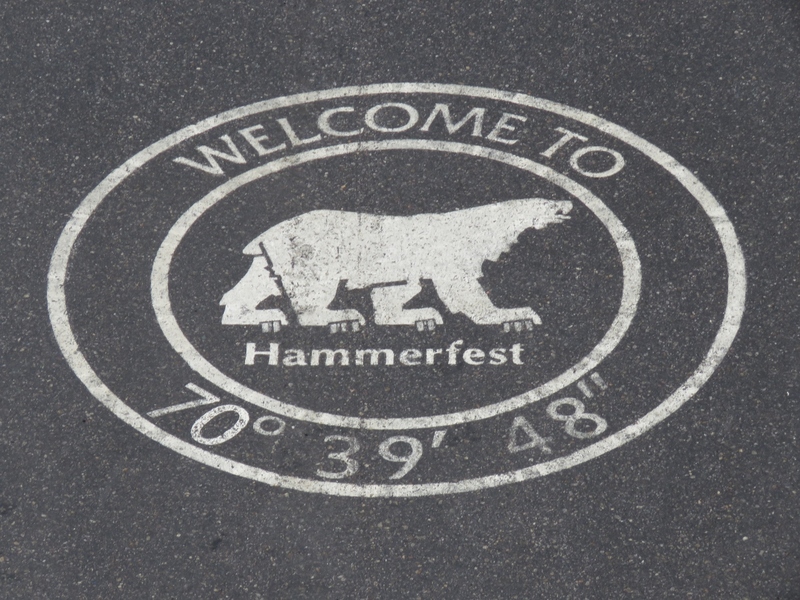 At 70° 39′ 48″ north, Hammerfest bills itself as the most northern town in Norway, arguing that all the other settlements farther north are too small to be considered towns. 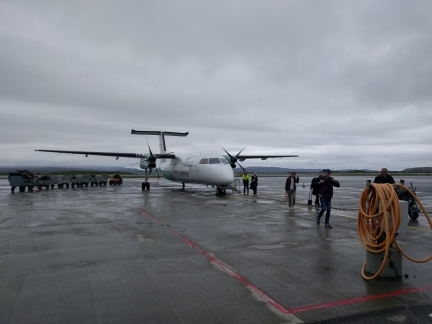 We’ve seen a lot of “most northerly” things in the past few weeks :). We spent most our time in Hammerfest at the excellent and sobering Reconstruction Museum, describing how the city was destroyed during World War II and later rebuilt. 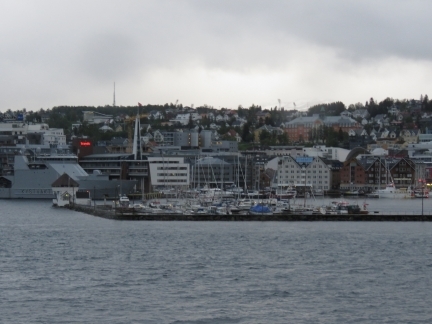 Norway was neutral during World War II, but in 1940 was invaded and occupied by Nazi Germany for its strategic north Atlantic ports. Northern Norway in particular suffered much destruction as a result. 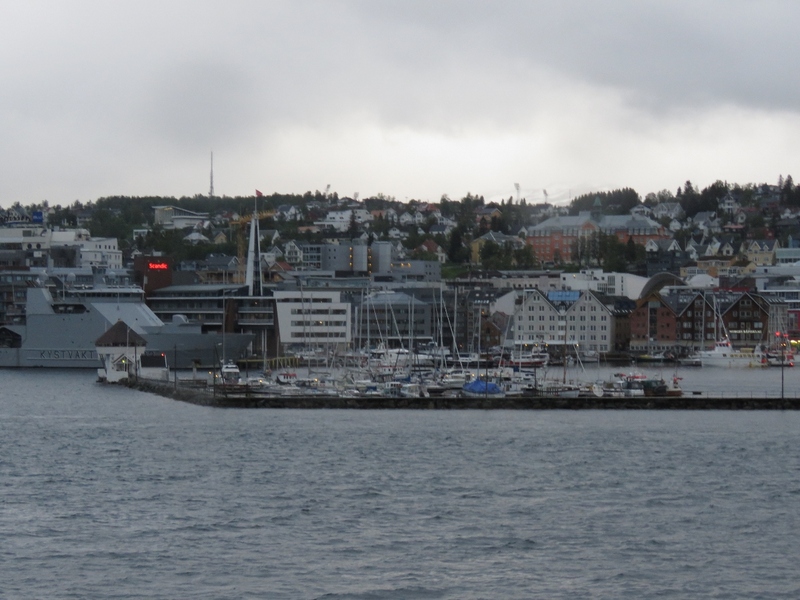 Kirkenes, where we boarded the Hurtigruten, was the staging area for the German attack on the Soviet port of Murmansk. The Germans stationed 100,000 troops there and the city suffered more than 300 Soviet bombing attacks. 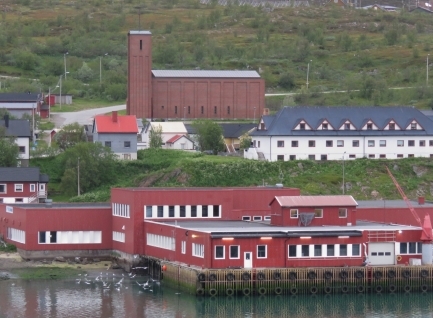 Hammerfest also was fortified as a major German base. When the Soviets advanced in 1944, the Nazis withdrew, destroying everything they could and forcibly evacuating the local population. They didn’t want anything left, be it food, shelter or people, that could help the advancing Soviets. Hammerfest was burned to the ground and left uninhabited. People couldn’t bring much when they were evacuated, so some buried their possessions in the hopes of recovering them later. 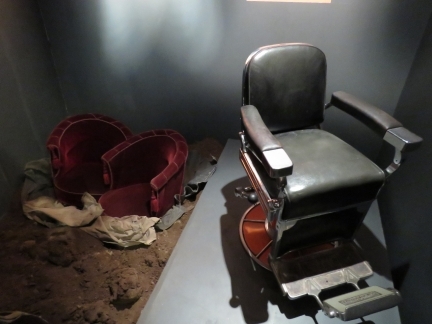 This display shows some of the few items that were recovered: two plush and silk armchairs and a dentist’s chair. Some of the locals escaped the forced evacuation by fleeing to the hills and sheltering over the winter in caves. 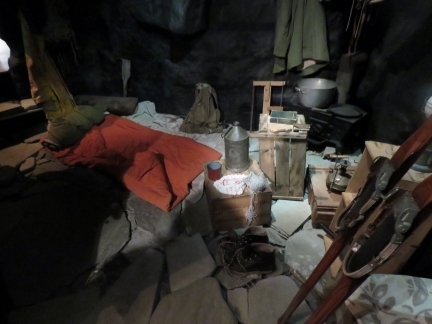 This is a replica of one of those caves at the Hammerfest Reconstruction Museum. 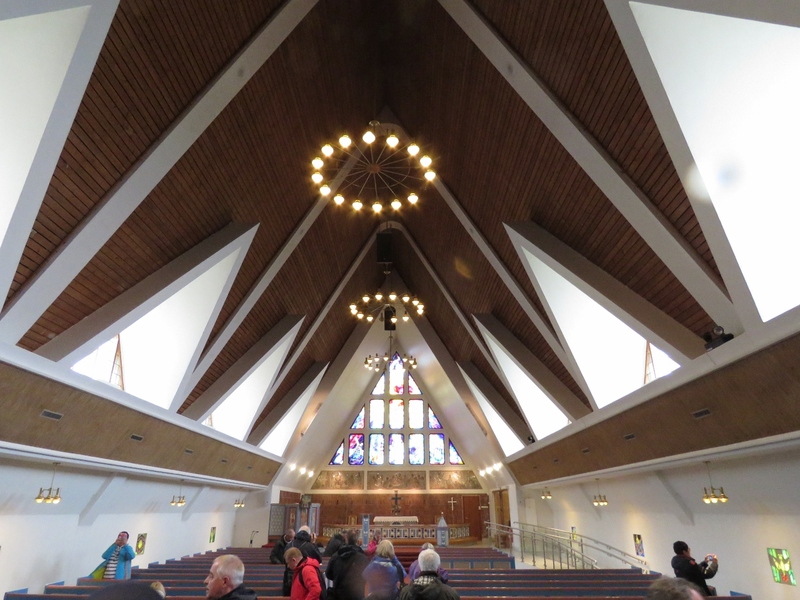 The Hammerfest Kirke (church), completed in 1961, was designed after the outdoor fish-drying racks that stand throughout Northern Norway. 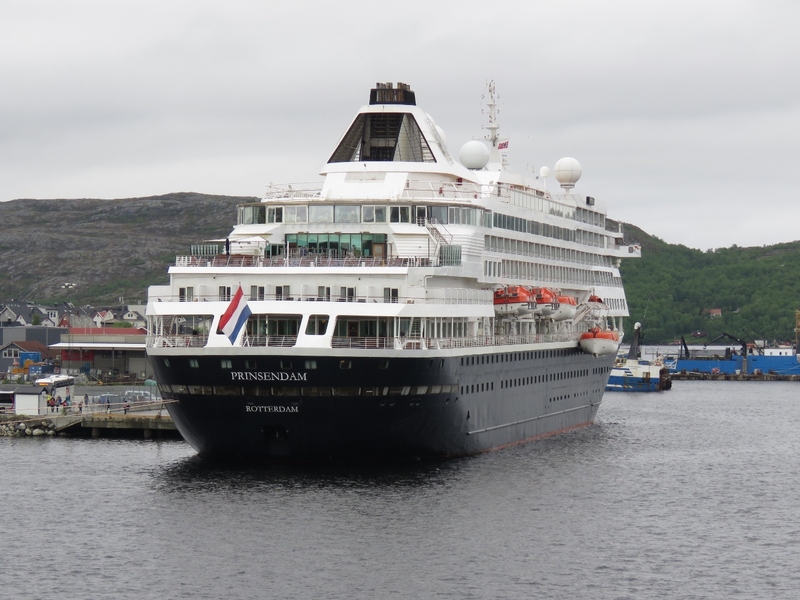 The cruise ship Prinsendam, that we saw in Kirkenes, arriving into Hammerfest as we depart. That’s a lot of visitors in one day for a small town of about 10,000 people. Enjoying a beer on the seventh deck lounge. 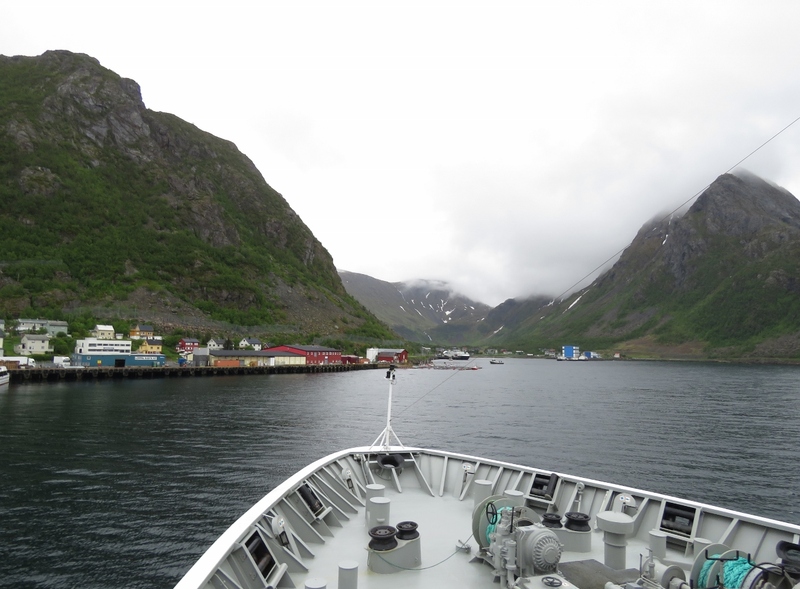 Coming into Øksfjord for a 15-minute stop. We had a 30-minute stop in Skjervøy, so had a chance to walk around town a bit. 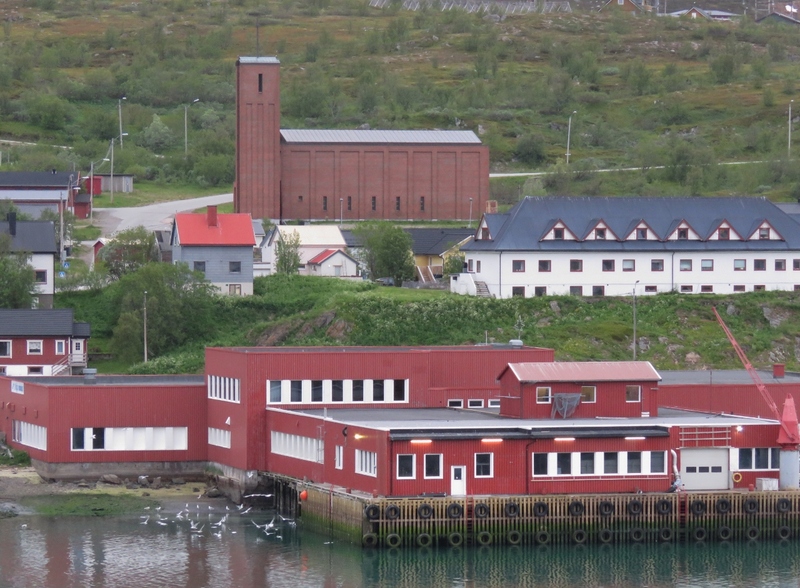 This is looking back to the Kong Harald from across the harbor. 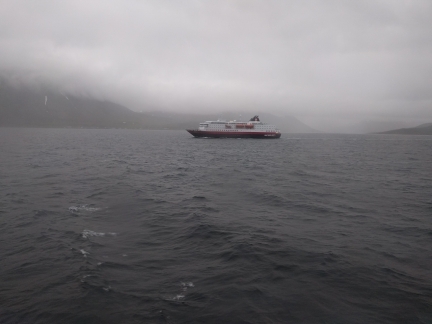 Overcast conditions as we pass the Hurtigruten Nordlys. The Spanish warship Alvaro de Bazan moored just north of downtown Tromsø. 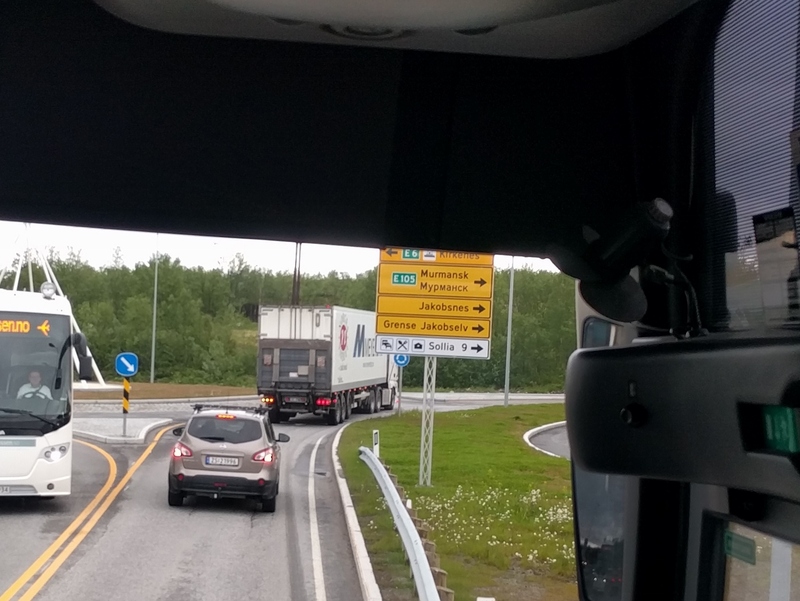 Passing through Tromsøyundet—we’re almost back “home” now. That’s the bridge we crossed to reach the cable car Fjellheisen a week or so ago. 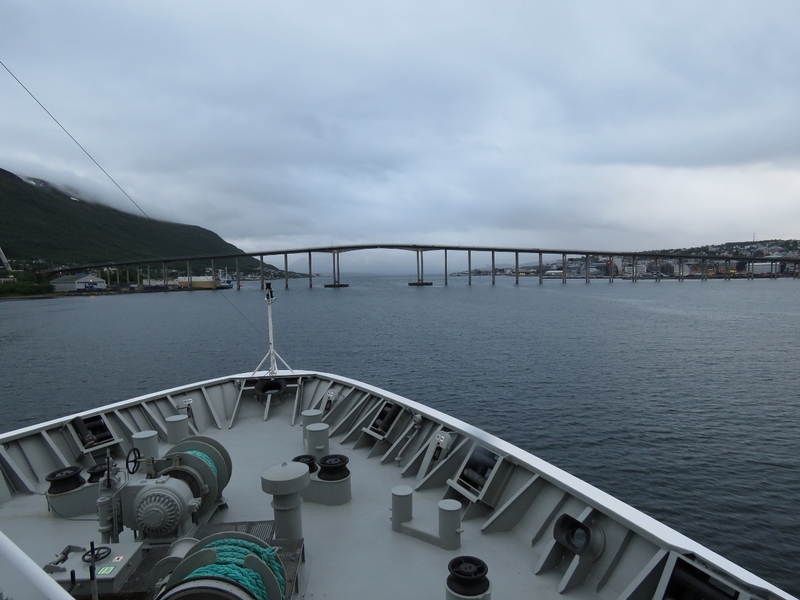 Passing Tromsø Haven on the south side of the bridge. 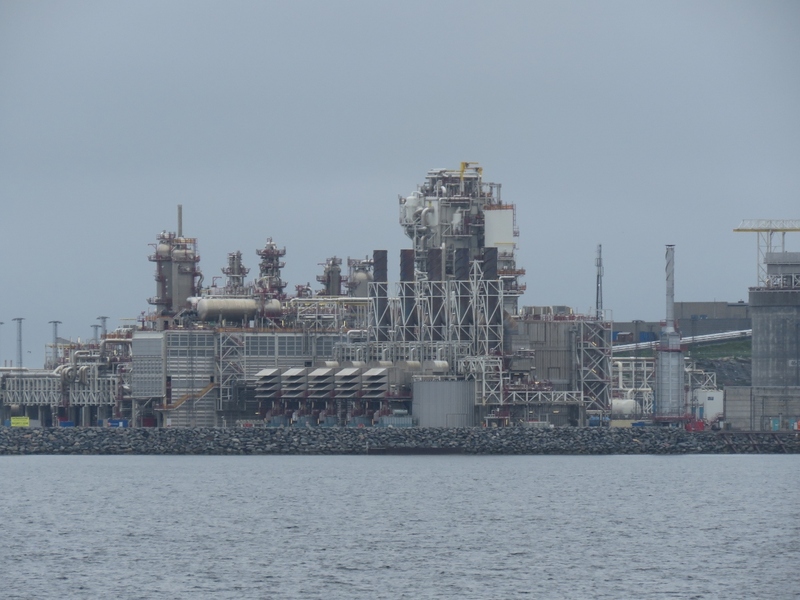 Dirona‘s stack is just visible about central in the photo, in front of the grey building. Our final Hurtigruten adventure was to take in a Midnight Sun concert at the Arctic Cathedral. 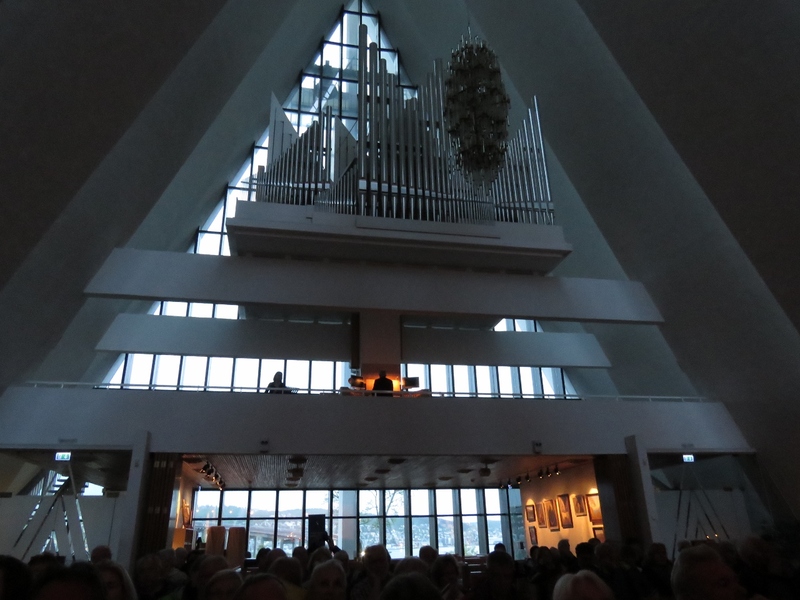 The show was fantastic, with an unexpected combination of saxophone, piano/organ and a singer. The mournful notes from the saxophone were particularly effective. And having the windows lit up with natural light at midnight still feels very surreal. 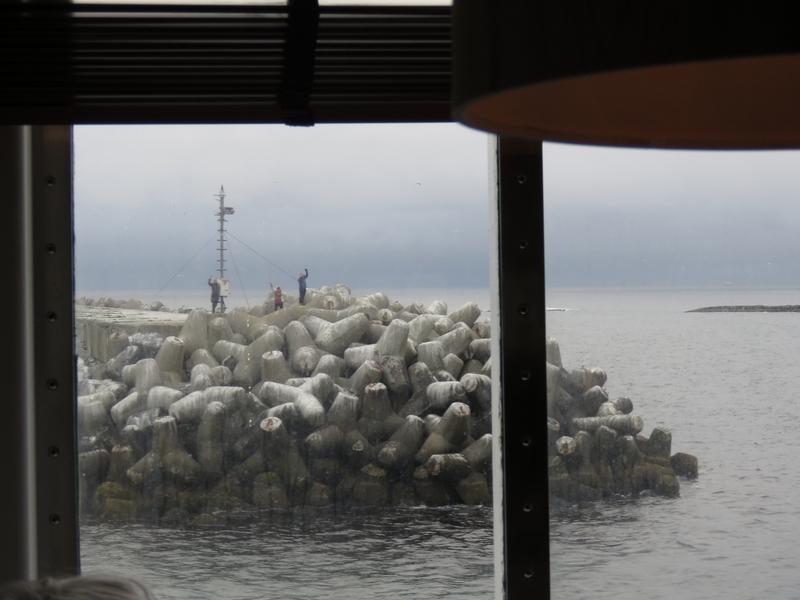 We finally returned to Dirona around 2:00am, and the bars overlooking the harbor were hopping. From the light conditions, it sure looks like 2:00 pm, not 2:00 am. Great blog. 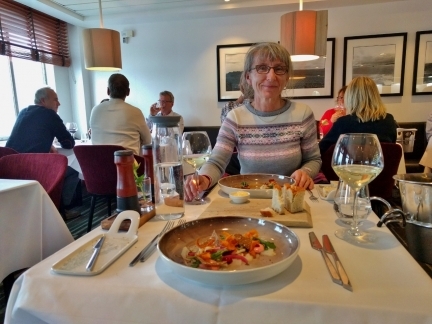 Loved the Svalboard experience. 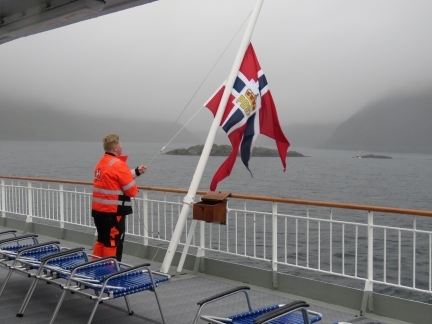 Would you rate the Hurtigruten ships as a good option to experience the Norwegian fjord area for casual tourists? 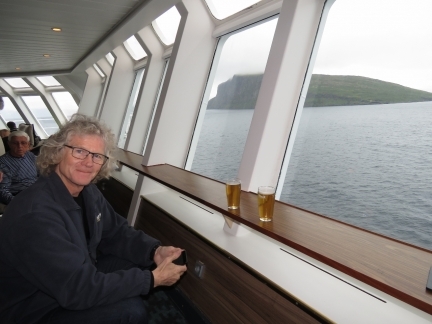 Were there many English-speaking folks on the ship? Yes, our take was the Hurtigruten’s are a great way to see the Norwegian coast area. The only thing I would fault them for is they don’t stop long. 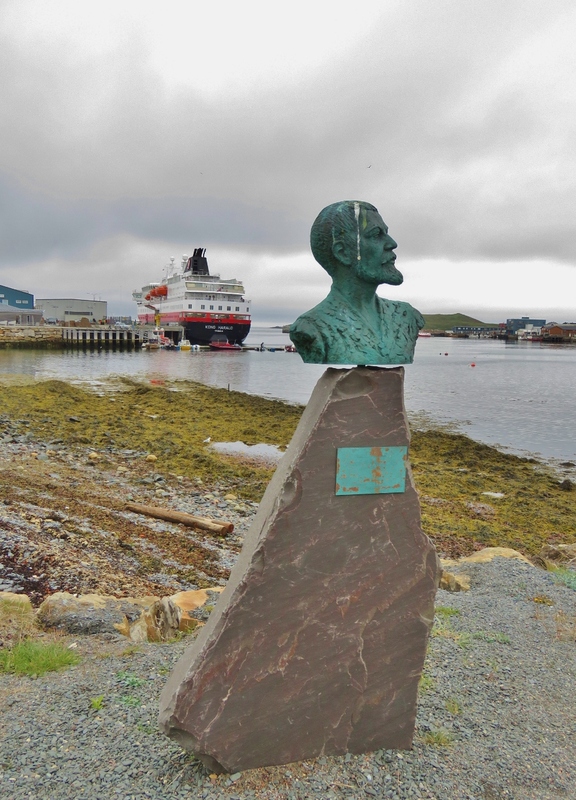 If you want to spend some time exploring some of the towns along the way for more than a 2 or in some cases 3 hours, you would need to do that by air or leave the boat you are on and take the next Hurtigruten on the following day. 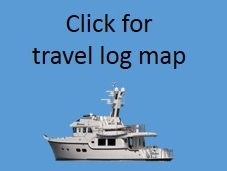 They run every day so you can always get 24 hours somewhere by scheduling yourself on the next sailing. 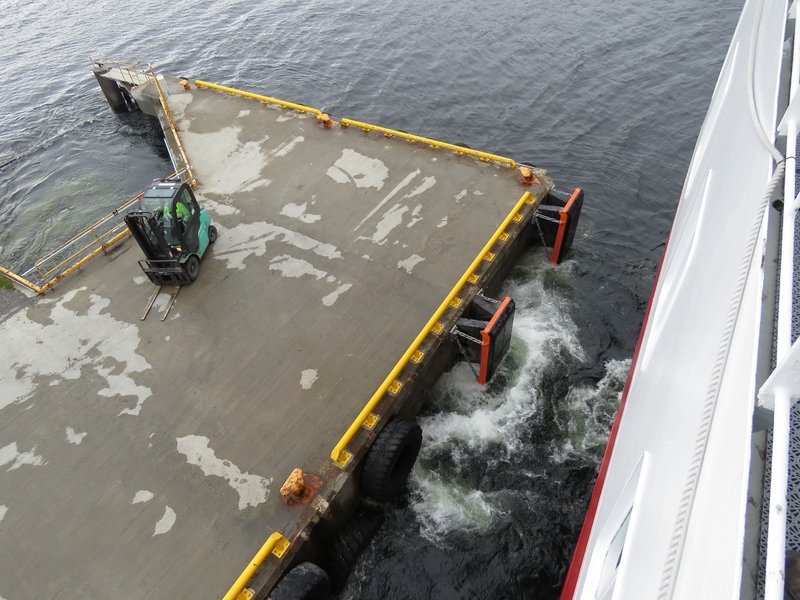 English isn’t a problem on board and we never ran into any language barriers while we were on board. James, I love following your adventure. Please keep these “trip highlights” coming. I would like to mention that I think in your last few posts (or maybe a few more). I think you have your “position” numbers swapped; I sure you are at 69.39 North, not East. We appreciate the feedback–it’s great to hear that you’re enjoying the posts. And thanks for pointing out the swapping of the lat/long position numbers. We’ve got that fixed.